Nothing to do with the subject of this blog, but I think even family lawyers like a good joke (they could certainly use one from time to time!). This one appeared on Charon QC a couple of days ago and is not the first time I've laughed at a joke published by Charon - another topical one, for example, appeared recently in this post. I attended my second session of the Kent Law Clinic the other evening. For details of the Clinic, see my previous post. What I wanted to comment upon here was the infectious enthusiasm of the students for their subject. On each occasion I have met them they all seem genuinely interested in the law and the opportunity it provides to help others. I don't know whether this is something that's instilled in them by the Kent Law School, but if it's typical of today's law students then I can only say that the future of the profession is in good hands. On the 30th August the Department for Constitutional Affairs published "A new procedural code for family proceedings", a consultation paper on the policy behind the proposed new Family Procedure Rules. The new Rules intend to achieve four 'key objectives': "modernisation of language, harmonisation with the Civil Procedure Rules, a single unified code of practice and alignment in all levels of court", and the paper seeks views upon how these objectives can be realised. 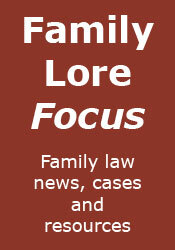 The paper includes some pretty fundamental changes to family procedure. For example, the proposed changes in terminology, which will (inter alia) see 'Decree Nisi' becoming 'Conditional Order' and 'Decree Absolute' becoming 'Final Order'. Respondents to divorces will no longer be able to file a freestanding petition, but instead will be given 21 days to make a cross application in the same proceedings. Applications for a financial/property settlement will no longer be included in the divorce petition (or 'application', as it will be called), so that petitioners (or 'applicants') will have to make a separate application for a financial order to ensure that they do not lose their right to apply after remarriage. If you wish to give your views the paper includes a 43-question questionnaire and a section for you to give details about yourself. Responses must be sent by the 1st December. As the observant returning visitor may have noticed, things have changed around here. I have given the blog a new look, which I think is an improvement over the old one, and also added some new features. In particular, all posts now have one or more labels attached to them, depending on the subject of the post. These subject categories are listed on the right, where you can find all posts on a particular subject. I hope you find the new-look blog better and more useful.